The crystal on your favorite watch has become so scratched you can hardly read the time, what now? Don’t throw away your watch! 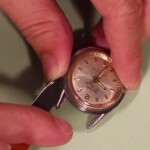 You can easily learn how to remove a damaged watch crystal with hand pressure using this guide. 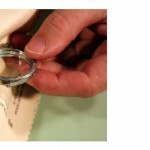 Wrap your Selvyt cloth around the watch case so that you cover both sides of the crystal to protect your fingers. 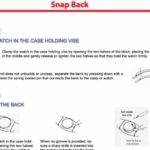 Turn the watch so that the back of the watch case is facing up toward the ceiling and hold the watch case so that your thumb presses down on the back of the watch crystal. 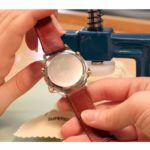 Check that the cloth is still sitting between your fingers and the watch crystal, then apply pressure with your fingers to force the crystal out of the watch case. When the crystal pops out of the watch case, set it aside. Depending on the condition of the watch crystal, it may come out in one piece or it may break into several pieces. 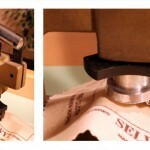 You can use your flat head screwdriver to scrape away any remaining shards of the crystal and glue. I have a swiss military watch nr. 092.0940 and need to replace the cristal witch i don’t now to order. The cristal is rectangle and surface is curved. Could someone tell me where to order and price ? Use this form to help our watch parts department identify the watch and find the right part for you.